A quick question... 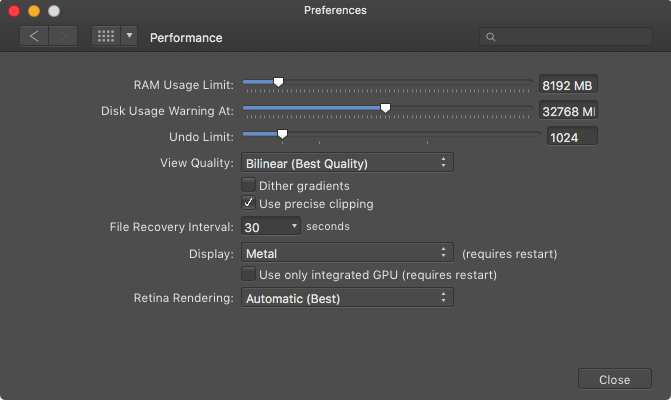 I'm running Affinity Designer & Affinity Photo on a Mac Pro 2010 with nVidia Quadro 4000 2gb GFX card on High Sierra 10.13.2 and cannot seem to get the 'metal' option under Performance to work - it's greyed-out. I've checked System Profiler and the report states Metal is supported. Interestingly, it works fine on my Macbook Pro Retina 15in (2012). Is this a bug? The Metal feature is only enabled for Intel HD and Intel Iris integrated GPUs found in the more recent Macs, this is why it is greyed out. If it's available on your Macbook Pro, check which graphics card is installed. The Metal feature is only enabled for Intel HD and Intel Iris integrated GPUs found in the more recent Macs, this is why it is greyed out. I am probably misunderstanding something about this but I use a "(Late 2012)" 27 inch iMac (model Identifier: iMac13,2). The GPU is an NVIDIA GeForce GTX 660M, which is obviously not an integrated Intel GPU of any kind. System Information says that Metal is supported. I have a Radeon Sapphire HD 7970 Mac and an AMD Radeon HD 7870 unflashed both support Metal on the OS (El Cap, Sierra and High Sierra) but both have the Metal greyed out in Affinity Photo. They are quite powerful GPU’s.